If you are here for my Lil'Inkers November Release Projects click HERE or scroll down! Welcome back to Day 2 of 25 Tags for Christmas. Today I have another guest for you, fabulous Kim Heggins of Cupcakes Cards & Kim. Kim has a very fun Santa tag for you today. Be sure to visit her blog and leave her some love. Here is my tag for today which is also my inspiration for this week's CASology Cue Card. When creating a CAS tag using a die cut and embossing makes your tag bold and memorable without being overdone. 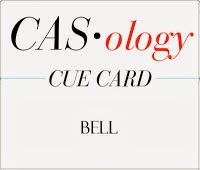 I can't wait to see what BELL means to you! Remember to enter the giveaway for the Tag kit you can enter each day following the same guidelines...become a follower and leave a comment, if you are already one of my followers let me know and if you want another chance to win follow my tag Pinterest Boards and leave another comment. On December 12 I will draw one random name from all the comments. Two Lil Inker gems! I love the santa belt buckle. Adorable! I love them both!! LOVING Kim's Santa outfit and love love love yours with the jingle bell!!! Gorgeous!!!! LOVE LOVE LOVE!!!! awesome tags! I love your tags! Especially, the bell one! So fun, love the santa inspired tag! Love the sparkly bell Tracey! Lovely cards, absolutely lovely! The red/white/black combinations are especially eye-catching on smaller canvases, and that bell of yours, Tracey....swooon! Inspiration,+++ for sure! Ack! more fabulous tags, love, love, love! you had me at glittery bell! EEP! Both are so cute!! Such a pretty silver bell. You already know I am addicted to those jingle bells...so cute and easy to make a whole bunch of these! I pinned your jingle bell creation right away to case. Fabulously perfect! Love the bells and I could hit myself for not including them in my order I placed just a few mins. ago.Fun tag Tracey! Love Kim’s tag too. I can here the jingling Tracey, guess that means I believe huh LOL!!! Very pretty love the sparkle! Great tags! Love the Santa outfit one, so clever and loving the sparkly bell too! I also follow you on pinterest. Thanks for the chance to win! OH fabulous tags Tracey! Kim's is darling and yours is so classy and elegant with the beautiful glitter!! So love it!! Two fabulous tags! Love Kim's Santa outfit and your sparkly bell is awesome! YOU have inspired me, Tracey...I am making my tags now...I have a cute snow-lady and snow man as tags...!! thanks for the inspiration! I love both of these tags, but Santa wins my heart every time. I am so happy you are doing your tags again this year. That is how I first discovered your blog. This bell tag is just adorable--the perfect amount of bling and glitter. And, of course, I am in love with your special guest tag, too. These tags are so much fun, Tracey! They are making me want more time to create! Awesome tags! Thanks for the inspiration. I love your sparkly silver bell, Tracey! 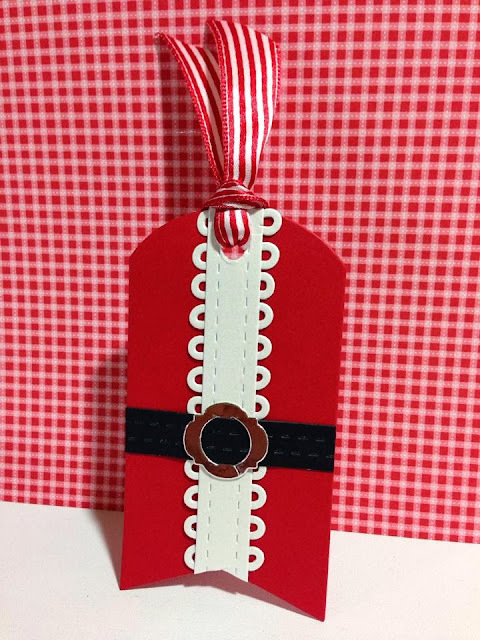 It's perfect for your bright red tag! two wonderful tags in red Tracey! love the Santa jacket and that super silver bell! Love the fun Santa tag and that beautiful jingle bell too! Great with a bit of sparkle! LOVE the bold red tags. The santa suit one is so adorable and the sparkly bell is so festive! Tracey, these are both A-dorable! :) Love all the sparkle on the bell one!!! So cute! Love the santa suit! I'm pretty sure jingle bells should always be sparkly. I love how it looks on your tag. I love how the jingle bell sparkles. I'm not sure if I am supposed to comment each day about joining your Pinterest boards--love the tags ones and so many more caught my eye. Now that I have made my way through all the days, I'm off to post all these wonderful tags. Thanks for the inspiration. 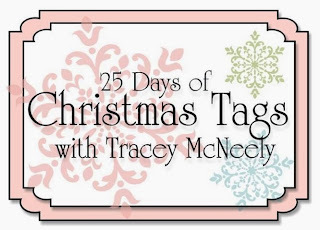 Tracey, I am loving ALL your Christmas tags, and this festive tag is gorgeous!!! 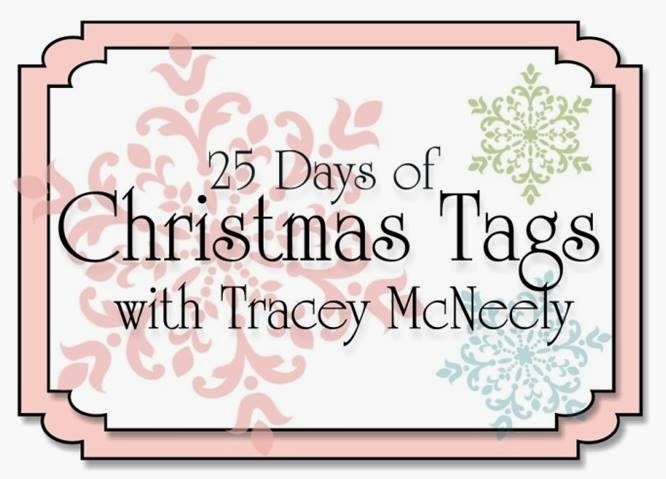 Tracey...thank you so much for asking me to be part of your 25 days of tags...you are so inspiring as about as creative as they come. Love your sweet tag, that jingle bell is so fun! That sparkly bell is brilliant, Tracey, and I love how it pops off of the red! Love the red and white!! I follow of Google Friend and am a brand-new follower on Pinterest. Yippee!! !